Originally launched in 2008, also in Geneva, the compact range flagship returns to the Swiss show with a number of exterior changes, including a brand-new grille designed to reflect the new "Lancia family feeling", plus new proposals for trim levels and engine versions. 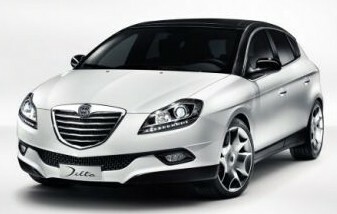 The very first thing we noticed about the Delta is that it has a new grille design that was penned by the Centro Stile Lancia and features horizontal instead of vertical chrome bars. It looks very much like the one found on Chrysler's latest vehicles such as the 300 and 200 sedans. The front end looks very dynamic, thanks to the bigger lower air intake, beefy grille and LED daytime lights and taillights. The Italian carmaker has also updated the Delta's trim levels which now include the base Steel, Silver, Gold and Platinum versions. Starting this year, European customers can choose between seven different powerplants for the Delta, namely thea 120 hp 1.4-liter turbo petrol, which is also available in a dual-fuel petrol/LPG version, a 140 hp 1.4-liter MultiAir turbo petrol; a 200 hp 1.8-liter turbo petrol, a 120 hp 1.6-liter Multijet diesel, a 165 hp 2.0-liter Multijet diesel, a 190 hp 1.9-liter twin-turbo Multijet diesel and a new base-model 1.6-liter Multijet diesel. That entry-level, which is on display in Geneva, 1.6 MultiJet turbo diesel is Euro 5-compliant and produces 105-horsepower and 300 Nm (221 lb-ft) of peak torque. This is enough to accelerate the car from 0 to 100 km/h (62 mph) in 10.7 seconds and on to a top speed of 186 km/h (116 mph). Matched to a six-speed manual gearbox, the diesel is said to return improved fuel economy (no figures were released) over the 120HP version and CO2 emissions 120 g/km. How many Delta3 are registered in the UK ?